This section discusses how Direct3D 11 is designed to support both new and existing hardware, from DirectX 9 to DirectX 11. 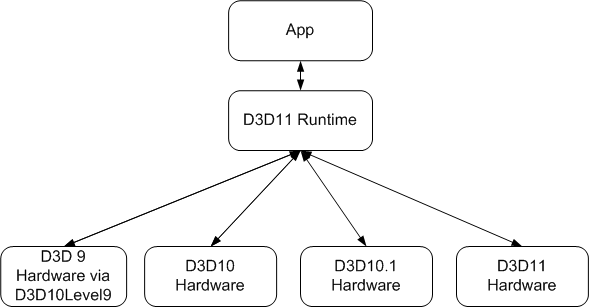 This diagram shows how Direct3D 11 supports new and existing hardware. With Direct3D 11, a new paradigm is introduced called feature levels. A feature level is a well defined set of GPU functionality. Using a feature level, you can target a Direct3D application to run on a downlevel version of Direct3D hardware. This topic discusses Direct3D feature levels. This topic describes exceptions when using Direct3D 11 on downlevel hardware. This topic discusses how to make use of compute shaders in a Direct3D 11 app on Direct3D 10 hardware. This topic discusses how to work around the driver receiving NULL shader-resource views (SRVs) even when non-NULL SRVs are bound to the pixel shader stage. How to get a feature level.